I'm often thinking one or two seasons ahead. So, despite the fact that it is the middle of summer, the last week or so I've been thinking of things for fall. I thought I'd share a bit of what I've been working on. Here are my fall themed works in progress. Just like last year, I'm making mini pumpkins. I'm adding a few new colors including a deep reddish orange seen here with a basic orange pumpkin, both partially finished. Also, I thought I'd try candle cozies. The one on the left is a pattern from Debbie Bliss's "A Knitter's Year" and the others are forms of some lace patterns in a stitch pattern book that I have. They are fairly quick to knit and look really pretty. Plus they are a great way to use old glass jars. I can't wait to see what they look like with candles burning inside them! I'll have more pictures later in the year. 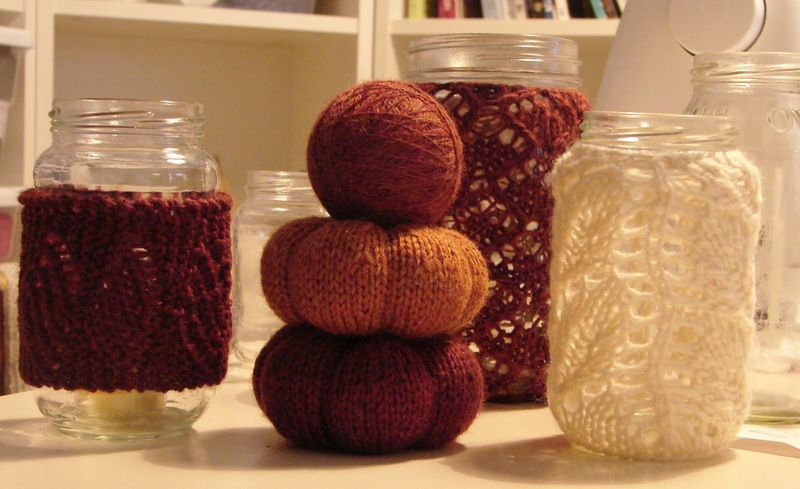 Can you tell me what yarn this is (deeper pumpkin - redish orange) ? I'm looking for this color for a project in my book I'm working on. But need it in a sport yarn. Thanks! They do have a sport weight version of this yarn, but that color is not available in sport weight. They may have some other sport weight yarns in a similar color though.